Destroy this card during your 3rd Standby Phase after activation. 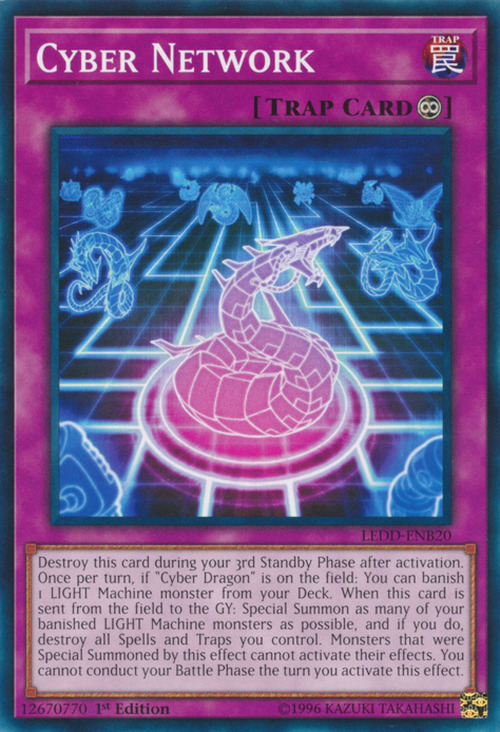 Once per turn, if "Cyber Dragon" is on the field: You can banish 1 LIGHT Machine monster from your Deck. When this card is sent from the field to the GY: Special Summon as many of your banished LIGHT Machine monsters as possible, and if you do, destroy all Spells and Traps you control. Monsters that were Special Summoned by this effect cannot activate their effects. You cannot conduct your Battle Phase the turn you activate this effect. Cyber Dragon, Cyber Dragon Zwei, Cyber Dragon Drei, Cyber Dragon Core, Proto-Cyber Dragon, Cyber Twin Dragon, Cyber End Dragon, Cyber Dragon Nova, Cyber Laser Dragon, Cyber Barrier Dragon, Chimeratech Fortress Dragon and Cyber Eltanin appear in this card's artwork. In addition, the silhouettes of other Cyber monsters, such as Cyber Larva and Cyber Phoenix, are visible in the background, albeit more difficult to make out. The "You can banish 1 LIGHT Machine-Type monster from your Deck." effect can be activated once during each player's turn. This card cannot be activated during the Damage Step. Also, the "You can banish 1 LIGHT Machine-Type monster from your Deck." effect cannot be activated during the Damage Step either. During the turn the "When this card is sent from the field to the Graveyard: Special Summon as many of your banished LIGHT Machine-Type monsters as possible, and if you do, destroy all Spell and Trap Cards you control." effect is applied, you cannot conduct your Battle Phase. Therefore the LIGHT Machine-Type monsters Special Summoned by "Cyber Network" cannot attack this turn. Afterwards, during your next turn, you can attack with those monsters. : When will the LIGHT Machine-Type monsters Special Summoned by "Cyber Network" be able to attack? LIGHT Machine-Type monsters Special Summoned by the "Special Summon as many of your banished LIGHT Machine-Type monsters as possible, and if you do, destroy all Spell and Trap Cards you control." effect cannot activate their effects, but their Continuous Effects are still applied. (You cannot activate their effects even after the turn ends. ): Are Continuous Effects from the LIGHT Machine-Type monsters Special Summoned by "Cyber Network" applied? The "Destroy this card during your 3rd Standby Phase after activation." is not treated as an effect of "Cyber Network". Therefore, even if "Royal Decree" is applied, it won't be negated. ("Cyber Network" will be destroyed normally. ): Does "Royal Decree" negate the "Destroy this card during your 3rd Standby Phase after activation." of "Cyber Network"? The "When this card is sent from the field to the Graveyard: Special Summon as many of your banished LIGHT Machine-Type monsters as possible, and if you do, destroy all Spell and Trap Cards you control." effect cannot be activated during your Battle Phase or Main Phase 2.: During your Battle Phase or Main Phase 2, if "Cyber Network" is sent from your field to the Graveyard, will its effect activate?